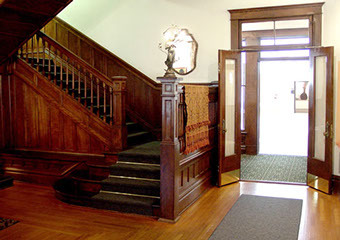 By enclosing a north section of Sunkist Villa’s porch, a private office for Major Thomas and an adjacent main office and registration desk for Hotel Thomas were created. The hotel office and front desk areas were converted to restrooms in the ’70s rehabilitation. 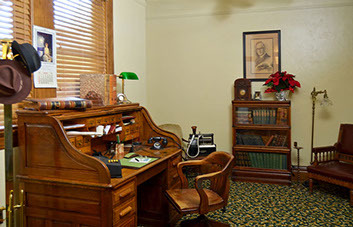 The Major’s Private Office has been recreated in its original space as a typical 1920s/’30s office. The windows in this room are high to accommodate the glass-fronted bookcases, which lined the family library. Later as one of the lounges in Hotel Thomas, the room also served as a place for private parties or salesmen’s displays. 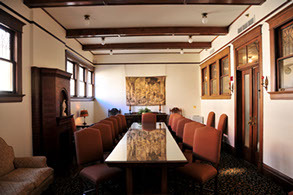 Now used as a meeting space, it echoes the hotel period with its 1920s style decor and custom-designed table. The room is named in honor of Lucille Maloney, founding president of the Thomas Center Associates. In Sunkist Villa, this sunny room was the family breakfast room. Lunch for the children was also served here, delivered from the kitchen of the nearby White House Hotel which was also owned by Major Thomas. For their evening meal, the four boys and little Margaret were bathed, dressed and taken to the popular White House Dining Room. In Hotel Thomas days, overflow guests from the big dining room were accommodated here, as were private luncheon or dinner parties. 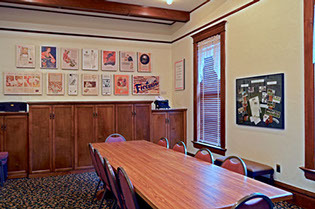 Today it is used as a meeting space, as the “green room” for performers, and as a staging area for caterers. All the displays relate to the time period in which Hotel Thomas opened. Sam Gowan, to whom the room is dedicated, was the energizing force behind the “Save the Thomas” movement in the 1970s when demolition seemed inevitable. The photograph hanging near the fireplace was taken when Hotel Thomas was celebrating its grand opening in 1928. Current furnishings reflect this era. 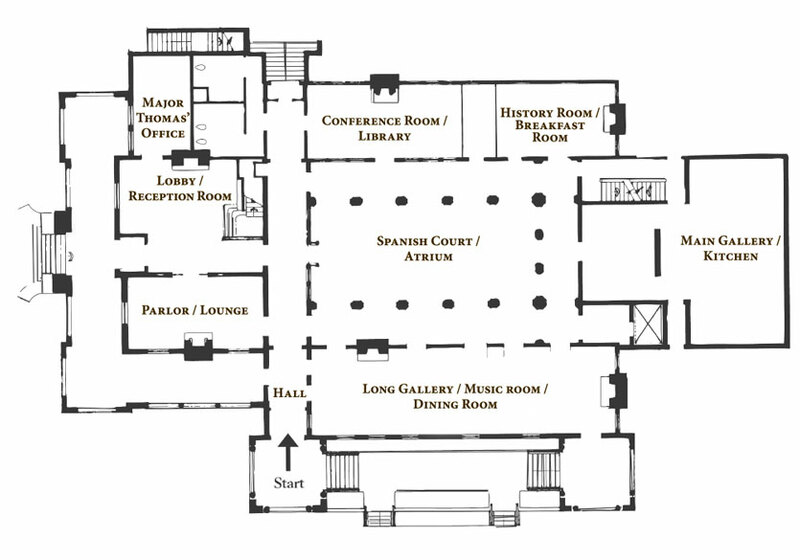 The room served a similar function — that of receiving guests ­— when it was part of a private home. The west doors were the formal entrance to Sunkist Villa. During hotel days, they led winter guests to comfortable porch seating, including swings and outdoor activities such as miniature golf. Although the Major’s private office was adjacent, he was often found in the large chair near the fireplace, socializing with his guests. The wall–hung exhibits provide an overview of Gainesville’s history, a brief biography of Major Thomas and some hotel artifacts. This space is drastically changed from its Sunkist Villa days as a screen-topped atrium. Picture a fern-filled sunken garden surrounded by covered porches. There were little paths and a small pyramid-shaped fountain. It was a favorite play area for the five Thomas children. When it was converted for hotel use, a terrazzo floor was poured. The arches and stucco, which still exist today, replaced the porch railings and shingle-siding of the Villa. The glass roof was added with a tarpaulin on pulleys to help control sunlight in the new space. During its hotel days, this beautiful room served a variety of uses ranging from dinner on Sundays to parties and fraternity balls. As our Cultural Center today, the room is still much in demand for meetings, performances and social events. As both a home and a hotel, this space was the kitchen. The unusual ceiling was designed to allow smoke and heat to rise and escape through a capped vent. 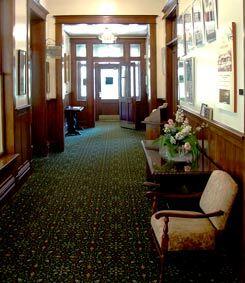 To accommodate a larger cooking and service area, the hotel’s architects enclosed the wide porches around three-quarters of the original kitchen (note the lower ceilings on three sides). Today’s art gallery offers exhibits that change quarterly and feature visual artists from Florida and beyond. Work in a wide variety of medium is presented. 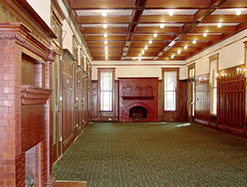 The typical decor of the 1920s is recreated in this museum room. A fashionable living room — or hotel lounge — might contain a variety of styles which were mass­­-produced adaptations of earlier European and American styles. 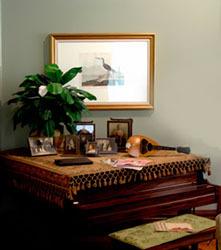 Favorite indoor pastimes are suggested by the items in the room. This period room illustrates Major Thomas’ philosophy of making his guests feel at home by providing large, inviting public spaces. In fact, some of the family’s parlor pieces, including the piano, were kept when the room was converted to the hotel lounge. When Gainesville “went wet” in 1963, this room took on yet another identity as part of the Cornish Arms Cocktail Lounge. The adjacent porch was enclosed to enlarge the space and the enterprise was awarded liquor permit #1 in Alachua County. It remained in business until the hotel closed in 1968 ­— with the old family piano still in its accustomed place! Guests of Hotel Thomas usually entered at this door. Registration was at the end of the hall where the restrooms are now. 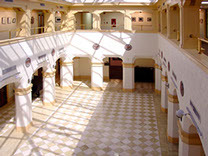 The hall at that time extended to the building next door where the 94 guest rooms were located. Offices for the City of Gainesville fill these guest rooms today. In the Thomas family home, this space was two rooms; a formal dining room at the east end and a music room in the west half. 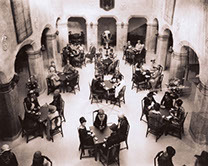 When Major Thomas altered Sunkist Villa to become part of Hotel Thomas, the dividing wall was removed to create the hotel’s Breakfast Room. Observe that each of the original mantelpieces, like the other four on this floor, are similar but not identical. Each mantel is natural terra cotta, sealed but not glazed. This room is now used for meetings and receptions.